We LOVE building things around here! Train tracks, pirate ships, farms, log cabins, cities, you name it, we build it. Lincoln Logs, Legos, MegaBlocks, we have them all….except TinkerToys! Build a whole bunch with your favorite TINKERTOY parts! The TINKERTOY 65 Piece Essential building set features fan-favorite TINKERTOY parts including spools, rods, flags, washers, end caps and more. The set is perfect for first-time builders and comes with a colorful instruction sheet that features building tips and ideas. Package doubles as a sturdy, storage box for easy clean-up and portability. Suggested retail price is $22.99. Ages 3+. 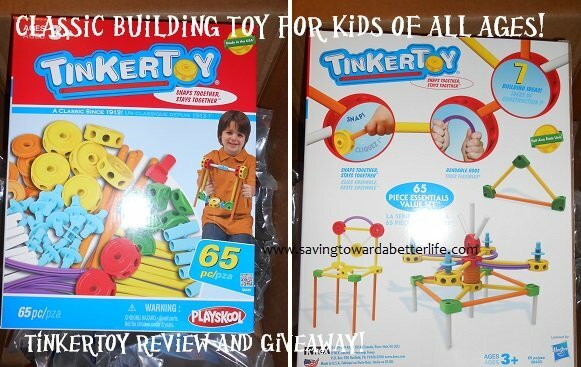 Do you have a little builder who would love building with TinkerToys? Enter to WIN a set for yourself! Giveaway is sponsored by K’NEX. I received the set myself in exchange for review. No other compensation was received. US entries only. Giveaway ends 8/18/13 at 11:59pm cst. Cool my son would love this! My son loves to build things. He would love this! My niece and nephew would enjoy playing with the TinkerToy building set. My son would love this. He loves building things. Three of my kids would love this toy! Everyone in our family would love this set! My niece and nephew would love this toy. They are 3. kristiedonelson(at)gmail(dot)com Thank you! My 2 year old son, my husband and myself would all love this! My son and husband would spend hours playing together with this! I’d play with my 9-year-old niece. My 2 sons would geek out over this set. Our grandkids would love this, thanks! Giveaways: Wanna Win Something! 8/15/13 - Madame Deals, Inc.